The competition is heating up between Samsung and Chinese smartphone makers as they race to create the world's first foldable smartphone. Sources say Samsung may produce thousands of prototype smartphones in Q3 2017. 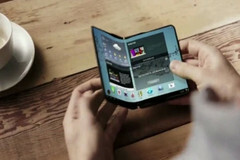 Samsung Electronics and Samsung Display are now in the last phase of development of a foldable smartphone and should have a prototype ready in the third quarter of this year. The race to create the world’s first foldable smartphone is on as Chinese manufacturers are also rushing ahead to produce their own prototype foldable displays. Industry sources said on March 13th that Samsung Electronics and Samsung Display have established a goal of releasing their prototype in the third quarter of this year. They intend to make thousands of these prototypes and distribute them to major customers such as mobile network providers to ensure that the phones offer the quality and performance consumers expect. There’s good reason to believe that Samsung’s foldable smartphone will be a premium product aimed at the high-end market of users eager to be among the first to try new technology. Samsung’s first foldable smartphone appeared at MWC 2017 to a carefully handpicked audience. Security surrounding the event was so tight that even some partners who’d helped Samsung create the phone were not invited. Chinese panel and smartphone manufacturers are close on Samsung’s heels, with companies like BOE, Visionox and AUO building foldable panels and working alongside smartphone manufacturers such as Lenovo, Oppo and Vivo.